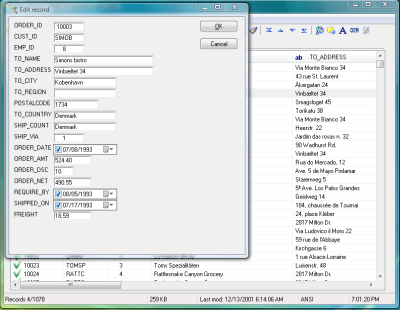 View and edit DBF files created with popular databases quickly and easily with a fast and compact tool. Extremely lightweight, Advanced DBF Editor is almost instant to load, allowing for quick preview and fast editing of your DBF files. Edit records and memos in DBF databases quickly and easily with just a few mouse clicks. No need to run a database application to make a few small changes! Query DBF files without having to load the whole project. Sort, delete duplicates, create and print DBF files or export data to a variety of formats without additional software. Advanced DBF Editor implements an amazingly compact and blazingly fast database engine that allows manipulating DBF files without a database application installed! Should you need to migrate your DBF database to a different platform, look no further. Advanced DBF Editor exports all records and data from the DBF database into a variety of formats, including DBF, TXT, CSV, Excel, HTML, XML, PRG, SQL, and RTF. Advanced DBF Editor v4.5 released! | Copyright © 2002-2016 DBF-EDIT.COM All rights reserved.